My fingers have been busy with a crochet hook and yarn making lots and lots of hats. Below is a sample of some adult sized hats that I just posted to my Etsy shop, Marvelous Meous Crafts, and I will be posting more items this week. Please visit the shop for details on these items, including pattern information. Any of these items would make wonderful gifts for family or friends. Hope you take the time to stop by. I enjoy cooking and trying new recipes. Recently I discovered a new website (well new to me, at least), Primavera Kitchen, which has lots of healthy recipes. Since I’m trying to cut down on carbs, I decided to give the Roasted Butternut Squash Mash at try. The recipe was easy to follow, and while the squash was cooking in the oven, I was able to prep and complete other dishes. Here is the squash cleaned, seasoned with salt, pepper, and minced garlic, and ready to pop into the oven for about 40 minutes. Now on to other dishes – homemade cranberry sauce is a must in my house. I just follow the basic recipe on the bag – with a few tweaks. I replace half the sugar with raw honey, and add a dash of ground cloves. Once the berries are fully cooked, just remove from the heat and add the zest and juice of one orange. I love using my vintage glass juicer; for some reason it just makes me happy. Spoon the finished sauce into a serving dish, let cool, and then cover with plastic wrap and refrigerate. Of course, if you’re like me you probably can’t wait to enjoy this yummy side dish, and sneak a little advance taste. Definitely one of the perks of being the cook! While the cranberries were cooking, I used the time to chop the veggies for the dressing. Originally, I was going to to skip the dressing, but decided to won’t be Thanksgiving without this traditional dish. My husband loves celery, so I always add extra along with the onion and some carrots for extra crunch and color. Plus they’re good for you! I like moist dressing, so I use about twice the amount of liquid (using the recipe on the package as a guideline) and one beaten egg to hold it all together. Once it’s all mixed together, just pop it into a covered casserole, refrigerate and you have one more dish ready for your Thanksgiving feast! While I was making the cranberry sauce and the dressing, the squash continued to cook. Once it was fork tender, I simply removed it from the oven and let it cool while finishing the dressing. It came out slightly browned and the roasted garlic smelled heavenly. Once the cooked squash is cool enough to handle, scooped out from the shell into a bowl or pot for mashing. My mashed squash it in a serving dish, and tomorrow all I need to do is heat it up a bit in the microwave. I’ve certainly gotten a good head start on the cooking for tomorrow. All that’s left to do is to clean and prep the turkey for cooking and get my vegetables ready. I’m going to put fresh herbs (rosemary, sage, & thyme) in the bird’s cavity and I plan on using Primavera Kitchen’s recipe for roasted Brussel Sprouts, adding carrots and parsnips, too. Hope you have a wonderful and delicious Thanksgiving! I know that I am thankful to Olivia of Primavera Kitchen for sharing her recipes with us. I wasn’t planning on making potato salad, but when buying grass fed beef (trust me, it tastes sooo much better) for burgers, I saw a bag of potatoes and figured why not! It’s not hard to make and if you know your way around the kitchen, you really don’t need to refer to a written recipe. Put eggs in a pan of cold water with about 1t of salt & 1T of vinegar (makes for easier peeling). Bring to boil and then remove from heat. Let sit for 20 minutes off heat. Add chopped potatoes to cold salted water and bring to boil. Optional Seasoning; I usually use Herbs de Provence, but my local store was out so I substituted and used about 1T of this seasoning blend. Potatoes cooking in seasoned water. Bring potatoes to a rolling boil; reduce heat and cook for about 5 more minutes. Taste for desired doneness. Drain eggs; run under cold water and place in ice bath to halt cooking. Drain potatoes into a colander and rinse with cold water to stop further cooking. Wash up your dishes. I like to clean as I cook so there is not a big mess in the kitchen. Have a refreshing beverage, you earned it! I’m having cold brew iced tea. Next steps for later in the day. chop pickles and add to bowl with the celery and onion. French seasoning mix, Italian dressing, mayonnaise, salt & pepper. Oops, almost forgot the dill. Add and stir in the chopped ingredients. The eggs to the left are for Deviled Eggs. Time for the herbs! Season with salt & pepper to taste. Mix well, place in lidded container, and refrigerate. Correct seasoning prior to serving. Clean up the dishes and you’re done! It took me about 35 minutes to chop, mix, season, and clean up. If I hadn’t been taking photographs during the process, it would have take less time. Added bonuses to your time spent in the kitchen – – tastes better than store bought, you can control the ingredients, the satisfaction and pleasure of making good food! Don’t forget to give your kitchen supervisor a treat. Previously, in creating our Crochet Flag Hanging, we did this Flying the Flag and then we did this A Stick and Some Stripes. Now we get to combine all of of our bits and pieces into this final, finished project. Your project won’t look exactly like mine, and that is a good thing because is is yours!! Step One (Optional): Have your project pieces approved by your fur baby. Shadow testing my work and giving her approval. Step Two: Lay out the pieces for assembly (Note: the arrangement is actually face down). The short stripes start and end with red along the edge of the blue Union field. The ends are not yet woven in as they are needed in the next step. Step Three: Working from the backside, sew your stripes onto the blue Union. I only wove in one end, and kept the other end for this purpose. I worked from the edges of the Union towards the center to ensure semi-even spacing. No measuring tools were used in this easy project. Step Four: To attach the long stripes to the flag, you will need a support piece (sorry, forgot to mention this earlier). You may use a length of ribbon, or as I did, crochet a strip of foundation half-double crochet (fhdc). I attached with a slip stitches (ss), putting a chain between the ss for flexibility. Step Five: After attaching the Union, continue with the stripes, beginning with white and alternating with red. Step Six: This is optional, but I decided to sew the first long white stripe to the Union for additional stability. Step Seven: Attach your completed flag to its hanger. What you do will vary. You can sew your flag onto a stick or rod, use nails or clips, or as I did, some strong glue. I chose to use Outdoor Mod Podge because there was some on-hand (no need to go and purchase any supplies – YES!!). Make sure you are applying any adhesive to the FRONT side of your flag along the top vertical ribbon and don’t be stingy with the glue. Your hanging stick will be on top of the flag. Please make sure that the blue Union is to the LEFT. Step Eight: If using a liquid adhesive, be sure to check dry times. I allowed about 24 hours to be on the save side. Turn flag to right side, Union will be on the left and attach string or other hanging device as needed. I used twine, from a dollar store, that was left over from a prior project. Step Nine: Your flag is now ready for display. Step Ten: Take some pics and share your talents and patriotism with others! Have a safe and happy 4th of July! Once you’ve decided on a stitch pattern for the Union (blue part of flag) you will also need to make the stripes and obtain a stick for hanging. This is your project, so be creative and make it your own! For my hanging stick, I took a walk outside and found a nice sized tree branch (no living trees were harmed in the making of this project). Since the branch had been on the ground for a while, I washed and scrubbed it well then put in the lowest setting of my oven to dry and clean by heating the wood through. My stick isn’t perfect, it has some bends and cracks and knotty parts, which makes me like it all the more. Carry a big stick and a bigger cup of coffee! If you don’t care for the “rustic natural” look of a branch you could also use a dowel rod, broom handle, clothes hanger – the type with clips (or not). Anything that will suspend the hanging will work! I have a piece of copper tubing from another project, and I could use that (I just now remembered that I have the unused length stashed in my craft room). For my hanging, I decided to use three different stitch patterns to make one of each of the standard stripes as noted above. A fourth pattern will be needed for the additional short red stripe, or repeat another pattern. My long stripes are roughly twice as long as the short, but I did not measure the stripes or count rows. If they come out a little uneven, that will just add to the charm of the project. This project is representational art so go with what works for you. If you really need everything to be exact, then measure and count away. Want more or less stripes, not a problem – – this is your project (which is why I’m not writing a pattern just giving a general project outline). Making a Wall Hanging for the 4th of July! This is not my original idea, but I was inspired by a photo I saw on Hillary’s Hook Crochet Along Group, a sister page to Hillary’s Hook on Facebook. However, Hillary was also inspired by another image from Meg Made With Love. Click photo for Meg’s project information. Instead of just copying what someone else created, I decided to use their idea as an inspiration for my own hanging. My project is currently in the works, and began with a little bit of research on the American Flag and reviewing stitch patterns to utilize. The Union, that’s the blue field with 50 stars, is part one of my version and is stitched with the Arcade Shell Stitch. 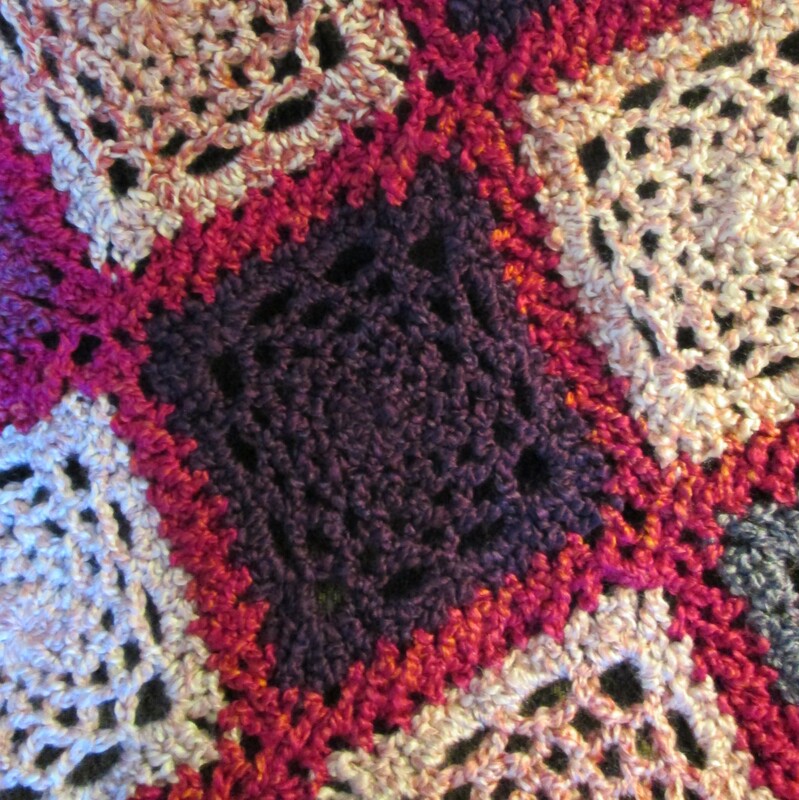 This stitch can be found on page 58 of Crochet Stitches Visual Encyclopedia by Robyn Chachula. I wanted to have 50 “stars” in my version, so following pattern instructions I chained 38. While creating the fabric, I realized that I goofed because the first complete row of “stars” was one less than I anticipated. To get 50 “stars” in this pattern, I should have chained 44. My prototype flag hanging will have a “star” missing. Opps! So, that’s the first part. Now to begin the stripes . . .